Greuze won success in the 1760s, when he began exhibiting scenes from the lives of ordinary citizens designed to teach a moral lesson. These story-telling compositions often incorporated figures in dramatic and "staged" poses that had heretofore been reserved for loftier historical and religious subjects. The subject of Worcester's painting is typical of Greuze's narrative compositions, intricately conceived and imbued with romantic and sentimental overtones. While the precise meaning of the scene is unclear, there is no doubt that Greuze intended a moralistic message. 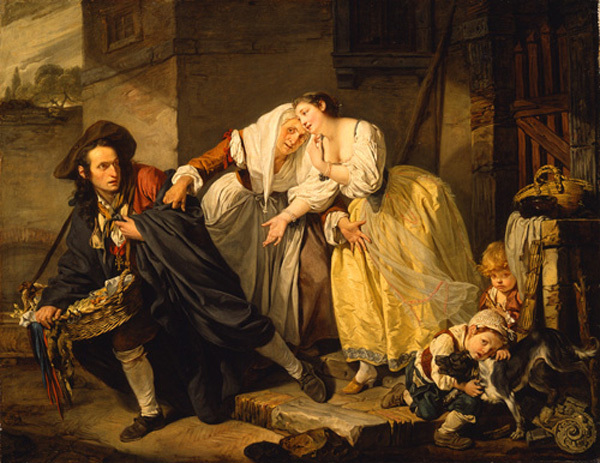 With a brokenhearted look and a "Neopolitan gesture" of dismissal, the young woman seems to send away the man dressed as a peddler; that his tradesman's costume is a disguise is clear from the cross of nobility he wears. Each figure's face expresses a particular reaction to the moment, including the old woman who tries to intervene and the two children at the lower right, one of whom attempts to restrain the barking dog. A superb draftsman, Greuze incorporated elements of still life such as the peddler's basket of colorful threads and sewing material and the ceramic pot and basket on the plinth at the right.